Avani Davda, CEO, Tata Starbucks Pvt. Ltd, a joint venture of Tata Global Beverages and Starbucks Corp., has resigned to pursue opportunities outside the group. She would be replaced by Sumi Ghosh, who takes over on January 1, 2016. Avani, 35, joined Tata Administrative Services in 2002 after getting an MBA from Mumbai’s Narsee Monjee Institute. She began as a trainee but became General Manager in five years. In 2008, she became Executive Assistant to Krishan Kumar. 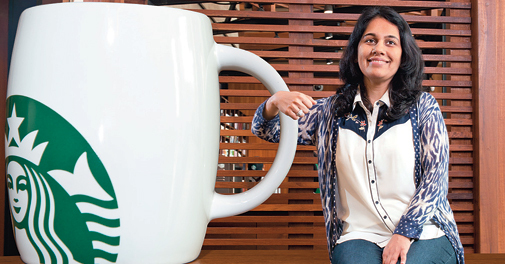 In 2012, when Starbucks opened its first India store, she was picked to lead the team. Starbucks now has 78 outlets in India and its pace of expansion has been a record in its 43-year history. Tata Starbucks earned a revenue of Rs 1.71 billion in FY 2015, up from Rs 0.95 billion in the previous year. The new CEO, Sumi Ghosh has served with Starbucks for eight years and was till now Vice President of the US Midwestern Region. He would relocate from Chicago to Mumbai to take up the new assignment.